Welcome to day one of the Christmas Is In My Heart Blog Hop. It makes my heart happy you're here. Christmas is one of my favorite holidays. I love being with family during the Holidays so it's naturally "In My Heart". One of the requirements for the hop was to create a project that had at least one heart in it. My project today is definitely a "Christmas Is In My Heart" kind of project. You see, a couple of years ago my sweet friend in Texas, Mitzi had to clean out her mother's house a few years after her passing. She was so overwhelmed in getting started. Let's just say that Mitzi's mom didn't like to throw anything away! Another friend and I came to her rescue and worked relentlessly for hours a day and days upon end until the three of us finished the job. Of course I was assigned to the "sewing room". Mitzi's mom had lots of UFO's (of course she did, she was a quilter!) and among them was this project. Mitzi was going to throw it out and I said "No, how about I take it home with me and maybe someday I'll surprise you and finish it." We both laughed but I took it home anyway. I'm sure she's forgot about the project. I know I did until I moved and unearthed it while organizing my sewing studio. This is what Mitzi's mother had completed. 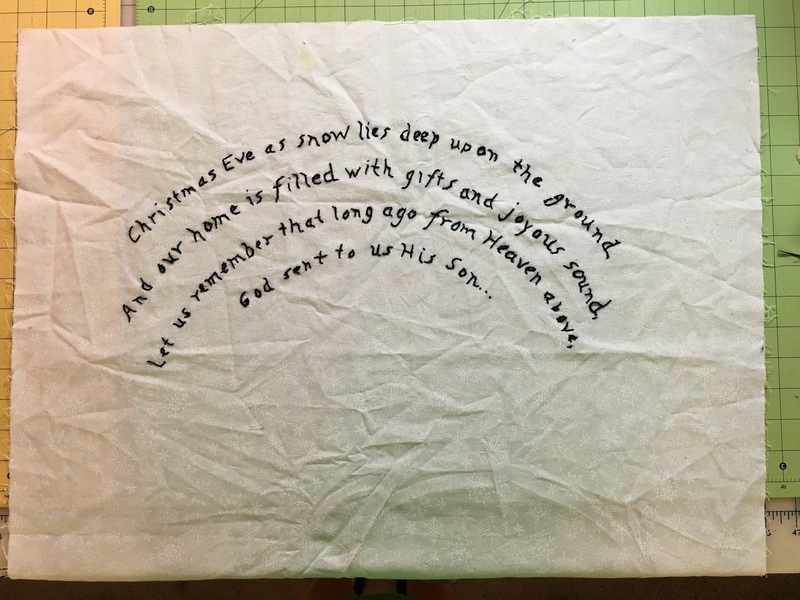 It was missing the bottom last line of the verse and the applique of Baby Jesus. And of course, the remainder of the quilt. Here is what I finished with. It really makes my heart swell to think how surprised Mitzi will be when she gets this in the mail. I really wish I could be there to give it to her in person. I can already see her reaction in my mind when she sees it and of course the tears that will follow. I even added my own little heart on Baby Jesus' blanket. After all, Jesus is the heart of the season and the reason for the season. HE is in my heart all the year through. My first project I thought of for this blog hop was this apron I found in my move as well. 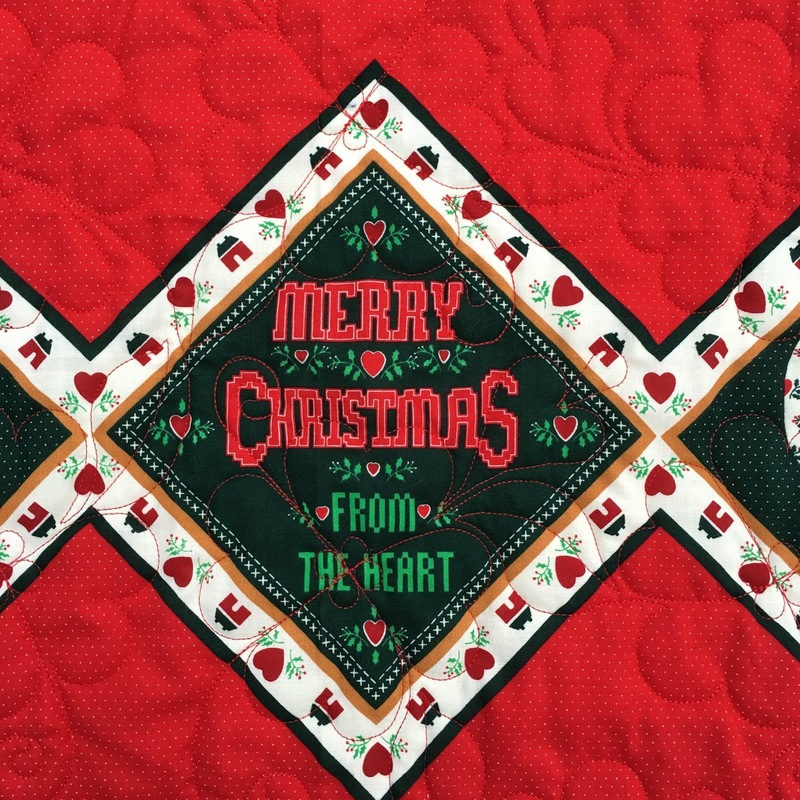 It fit all the criteria for the Christmas Is In My Heart Blog Hop; it was Christmas related, and it had hearts on it. I can't even tell you how long I've had this apron and never finished it. And WHY have I not finished it? It wouldn't take me any time at all to finish it. I guess I was waiting for the perfect reason and here it is. 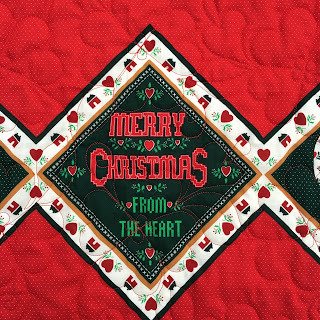 Ms Bessie looks great modeling the Merry Christmas From The Heart Apron. 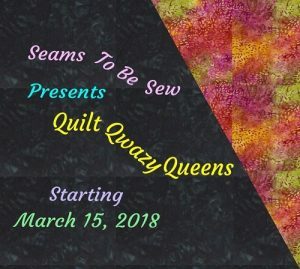 I would like to thank Marian at SeamsToBeSew for organizing this fabulous blog hop and The Fat Quarter Shop for sponsoring this blog hop. What is the Christmas In Your Heart? Leave me a comment and tell me what it is. 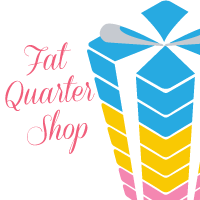 We're giving away a $25 gift certificate to the Fat Quarter Shop each day. Just enter the rafflecopter drawing. You can find all the rules and regulations at SeamsToBeSew. 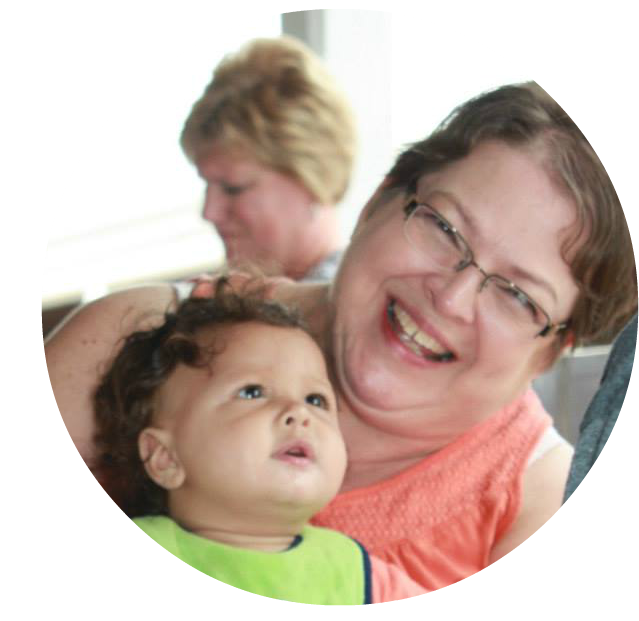 Now go visit all the other Christmas Is In My Heart Bloggers on the schedule for today and show them the love in your heart. You can also find the full schedule here. Oh Doris, you definitely touched a spot in my heart, as I have tears in my eyes. What a heartwarming post. You definitely captured what Christmas is all about. What a wonderful gift for your friend. She will treasure it forever, I'm sure! Your apron is adorable, too! The Christmas in my heart is the love I have for my family. I am richly blessed. The wall hanging is lovely, and the apron is so Christmasy! What a dear sweet thing to do for a friend! Lovely apron too! Simply charming. Your friend will feel so blessed! You are a good friend! Lovely apron! Doris, I found Christmas in your heart today along with Mitzi, and Margie, and even Miss Bessie, she wears that apron proudly and I bet you'll have a tough time getting it away from her.. :) What a beautiful gift of love you've chosen for your friend Mitzi and yes, those tears will be a coming, they were for me and I was only reading. I love the heart on Jesus' blanket. Just really wonderful. The christmas in my heart is my family. Thanks for sharing! 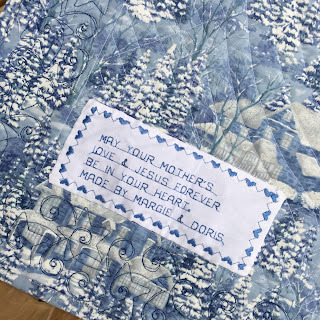 I especially love the baby Jesus quilt that you finished for your friend. Wow! Christmas in my heart not only means Jesus but my family. Such a special time. You've got a very special friend there! Merry Christmas to you too! Christmas in my heart means being close to my family and making time to send loving thoughts to the ones who are far away. I live your blog and this whole blog hop. I work (play?) throughout the year making Christmas gifts for my family and friends. Knowing that I will have lovely handmade gifts to give makes me happy all year long. Sometimes the hardest part is waiting until it is time to give the gifts! Your quilt gift is certainly what Christmas is really about. I love aprons. Your Christmas apron is so festive. I want to find time to make one!! Get together with family and friends... and eating treats ;) thanks for the chance, wonderful and inspiring projects!! What a beautiful gift! I know your friend will treasure it forever. And your apron is cute too, glad it finally finished it. Beautiful! I love the 9 patch border on your mini. Great projects! What a wonderful story about finishing the quilt, I'm sure there will be lots of tears when she sees it. That's what Christmas is, friends, family and kindness. Very cute. I Love the little hearts. She will love it! Tears came to my eyes thinking about how pleased she will be. Christmas in the Heart means to me family. Sharing the meaning of the season is most important to me. 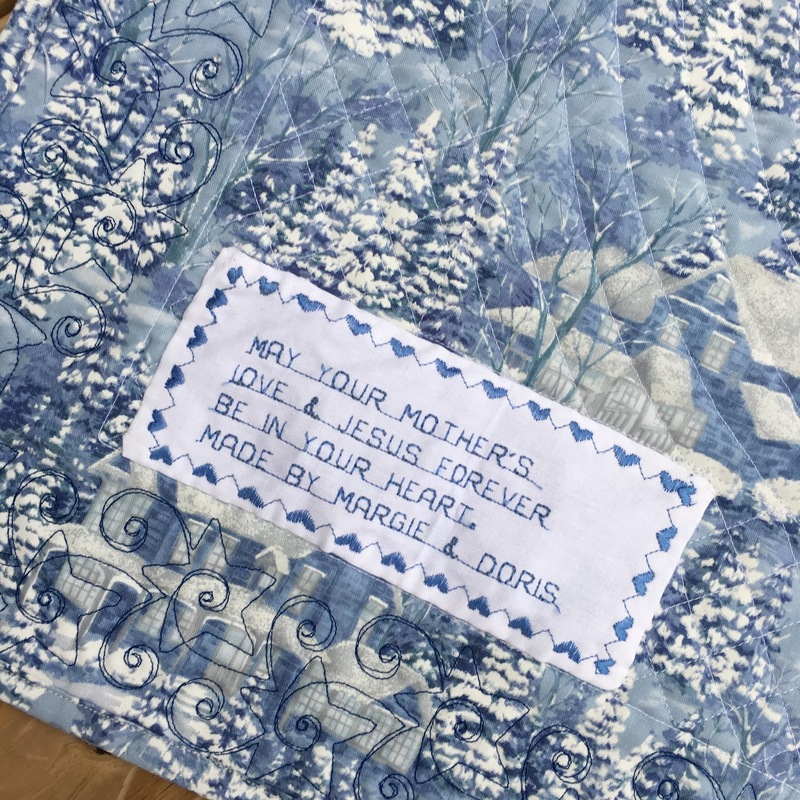 My heart is full with your fabulous finish of your friends mom's stitchery. What an incredible finish. I know your right about how she will react. You just gave a gift that will be cherished forever! Christmas in My Heart, like you means having Jesus. Love your projects as well. Christmas in my heart is Jesus! As you said He is the reason for the season. 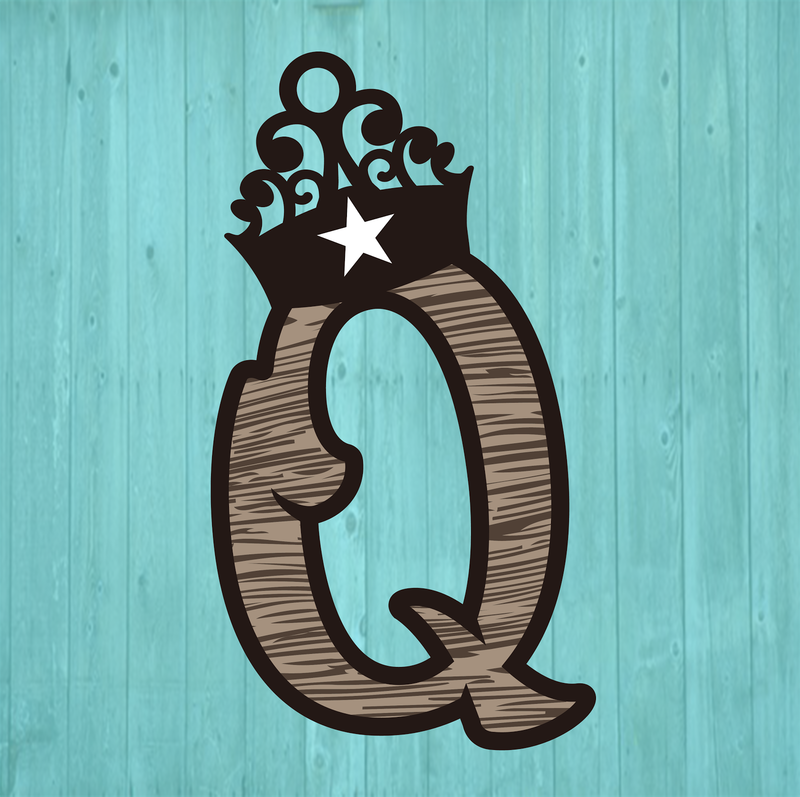 What a wonderful project to complete for your friend. You are the best. Love the apron too! Beautiful work you've done with that work your friends Mom had started. She will cherish that forever. That is such a pretty apron and so very Christmassy. I love it. Christmas in my heart and every day is all about my family. They are all close to my heart even if they can't be at my home for Christmas. Christmas to me is not the commercialization that happens these days. It is the time to celebrate the birth of Jesus. Christmas is about family, both near and far, who live forever in your heart. Christmas here in Sri Lanka is very traditional with religious festivities taking a number one position. Of course family and celebrations are also important. I love your sweet gift for your friend. For me Christmas has always been about giving and I really love that perfect gift. your friend will be so happy to receive your gift from your heart and her mom's. Such a pretty apron, puts me in the Christmas mood. Christmas in my heart is picking a child's name off the angel tree and getting them what they really want. I also buy a bicycle that I give to Toys for Tots. It's so much fun to know that whoever gets it will be so thrilled and surprised. She will be so happy, a special gift from her mom and best friend. What a wonderful thing to do for your friend. She will cherish that piece forever. The apron is amazing. So glad you are finishing it after all that work. Enjoy the season. lovely quilt. For me, Christmas is about family and friends. What a touching thing for you to do. That put Christmas in my heart today. Thank you. How precious to have such a friend! This is christmas, reaching out to others! Love your apron very much too! I love the way you finished the quilt and I'm sure it will be well recieved! Such a sweet gift for your friend and that apron is so lovely! Being with my family puts Christmas in my heart. Thanks for sharing this today! Lovely post - love getting together with friends for Christmas! Christmas is being with my family and creating memories. "Christmas in my heart" is spending time with family. Great wall hanging. And Christ is the greatest gift. Christmas in my heart is family and helping others. Cute apron. Jesus is the reason for the season. I do so enjoy aprons....festive little joys! I love the finished piece!!! That is such a lovely gift. Cute apron too, Doris. Jesus gave the ultimate gift. As I get older I have found that giving from the heart is truly what Christmas is about. I'm doing a quilt for similar reasons, I know your heart must happy with this finished project of love. I wish I could see her face too. Oh, I understand completely. We just returned home to TN. We were in PA helping our son and daughtet-in-law clean and organize her fthrs home. He passed 3 weeks ago. It is very hard and touching. You did a beautiful job with her quilt. I am sure she's very happy with it. True friendship like yours are hard to find. The Christmas in my heart is the fact that Christmas is the only time of the year that my whole family is together again. Thanks! Christmas in my heart happens when I gather gifts for a needy family, through our church. We give them their wishlist items and a Christmas meal. Sometimes I have delivered the family their gifts. Your post is a lovely story! Your friend is going to be over the moon!! What a beautiful gift from your heart to hers!! Your apron is adorable too! What a beautiful and wonderful gift to finish and give your friend. I'm sure it will be treasured! What will be wonderful this Christmas is having my son home this year. He is in the USMC and was deployed last year. It's also wonderful for his 5 year old son that his Dad will be home. Your heart is in the right place...I loved your story of the UFO. Your friend is going to be head-over-heels in love with your little quilt. Then...you made the most fab apron with all it's color and all the hearts. Totally wonderful!! Such a special gift to treasure! Love the blues in the border. Thanks for sharing. Oh what a wonderful story...I wish you could be there to see Mitzi's face too... you will make her so very happy. That was REALLY nice of you to help her clean out her moms house..Thanks for sharing your lovely project. Christmas in my heart is the joy I feel when I am surrounded by my family. So beautiful. There is no better gift than God's gift to the world. Salvation through Jesus. Christmas in My Heart is being with my grandsons! Christmas in my Heart, is my Lord and Savior, Jesus Christ....He is the reason for the Season! Taking out the treasured decorations and the memories that they bring puts Christmas in my heart! What a Christmas treasure for your friend. The fact that her mother stitched it makes it so special. And you are such a lovely Christmas friend . Merry Christmas. What a wonderful Christmas in my Heart Finish for your friend, Mitzi. I love Christmas as my Mother ( she has been gone 15 years now) made most of the ornaments on my tree. I can hardly wait to decorate. My mother also was very talented and made personal ornaments, usually beaded for the trees of all her brothers and sisters, her five kids and their families. It takes a lot of love to do so much to make Christmas special for so many. What a special friend you are! 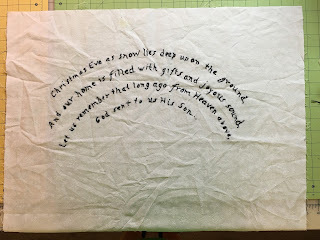 First helping your friend with cleaning out her mother's house, and then finishing that precious christmas piece for her! What fond memories she will have and you two can now share! Merry Christmas! 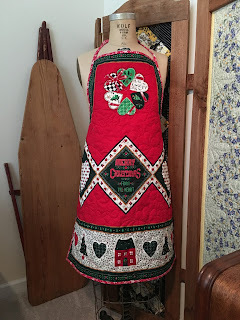 Great quilt and apron. I love seeing my family enjoy hand made gifts and the food I prepare. Thanks for the inspiration. First is our Lord of course. But second, I love making things for people I love. 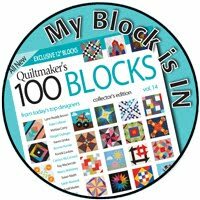 This year I am making a quilt for our youngest grandchild. Wish I could be there when he opens it. Your friend is very lucky to have you in her 'family'. For me, Christmas is being with family and dear friends. I love the quilt you completed for Mitzi! I'm sure she will be thrilled. What a sweet, heartfelt gift! Beautiful. Mitzi is sure to love it. Your apron is wonderful, too! How very special that wall hanging is. I'm sure it will be treasured. What a great gift. I love the love I feel at Christmas. Thanks. The Christmas in my heart is love for family & friends. You are such a good friend to make that special memory quilt. Very nice projects! The apron is certainly unique. Why are all of the Rafflecopters closed on these blogs when this just started? Lovely projects. 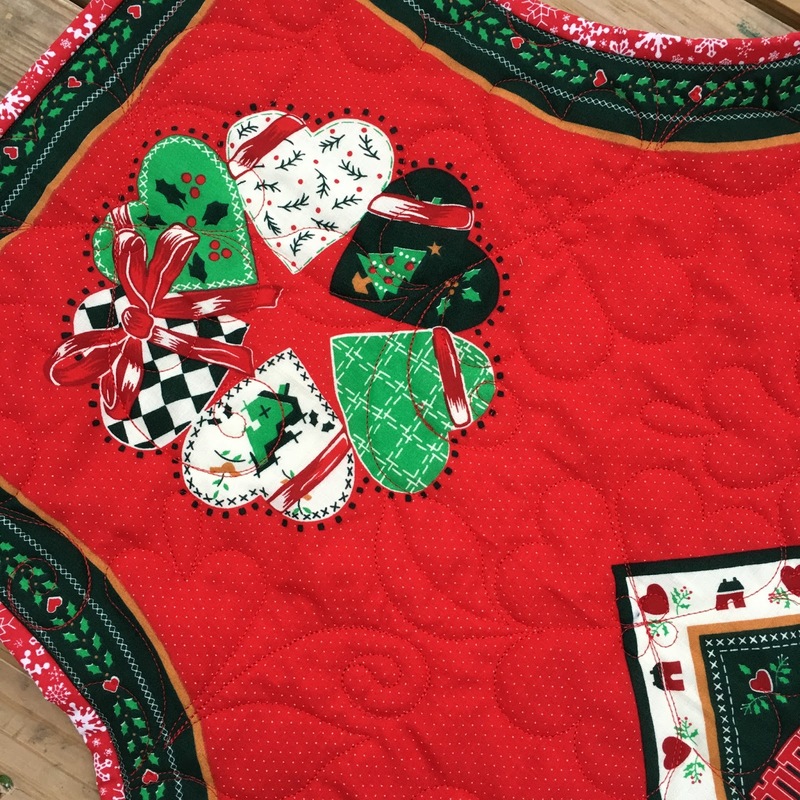 Love all those cute little nine patches and the apron is so much fun! The gift you finished for your friend is so touching. Yes, there will be tears I am sure. What a sweet friend you are. And your apron is lovely. Thanks for sharing such a heart warming story. I truly enjoyed reading your post. What a lovely surprise for your friend. I think the apron is cool, good you had a reason to finish it. I would say the heart of my Christmas is Family Love, even though many of us have moved farther away and aren't able to gather for Christmas Day. What a blessing! You forgot to warn us to bring kleenex! My project for tomorrow has a similar story. 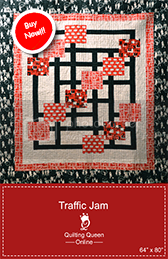 I love the simplicity of the quilt. And the message too. The best of Christmas is Jesus. My phone auto corrected that. I was really typing the *heart* of Christmas is Jesus but auto correct was right too!